The path to 18OE on Kickstarter! By Mark Frazier on June 17th, 2013. The Kickstarter Project went live this morning! By Mark Frazier on June 7th, 2013. 'Monster' games are called monsters for a reason - they're huge, and take a long time to set up, play, and put away. Most folks don't want to dedicate an entire day to the effort, for various reasons: table space, time, and availability of opponents. While 18OE and its cousin, 18C2C, don't come close to the time requirements of monster wargames, they certainly do consume a large amount of table space and an entire day to play. Many, if not most monster games alleviate the time problem by providing short and medium length scenarios to play, and 18OE is no exception. This allows players to still enjoy the game while spending considerably less time to play, and also gives them a chance to learn the rules more thoroughly if they wish to dive into the full game. 18OE provides two scenarios: a short scenario and a medium scenario. The short scenario, 'The Great Train Race', uses only two Track Rights zones, 6 Regionals, 4 Minors, and a few of the Privates. 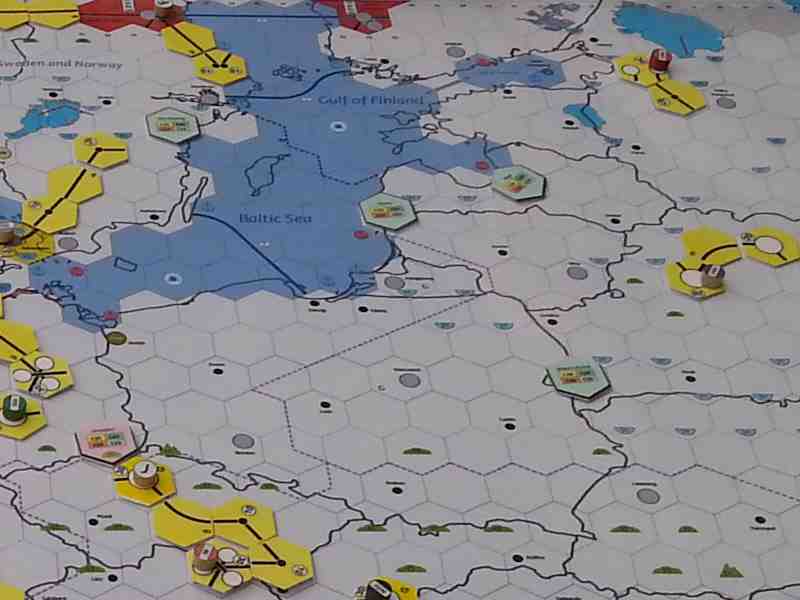 This scenario, set in France and Germany, takes only 4 hours to play, and supports two or three players. The medium scenario, 'Age of Industry', adds the Great Britain Track Rights zone, and has 9 Regionals, 6 Minors, and a few more of the Privates. It takes 6 hours to play, and supports two to four players. Another aspect of accessibility for large games like 18OE is a playbook. A good playbook provides alot of quality extras to the players. The 18OE playbook contains several useful sections. First, on component usage, which can help players to understand the designer's intent and players to see the state of the board and opponents' holdings. Second, a section on game etiquette, which can help players to speed play. Third, a strategy guide, which can ease the learning curve. Fourth, a game walkthrough, to provide a good sample of play. Fifth, game variants and scenarios, which can be used to significantly reduce the play time. And lastly, a historical section, to provide extra flavor for those interested in the history of the Railroad Presidents depicted in the game. The initial version of the Playbook has been posted, for you to peruse. The game walkthrough and examples sections need to be fleshed out, but will be completed as the artwork is finished. 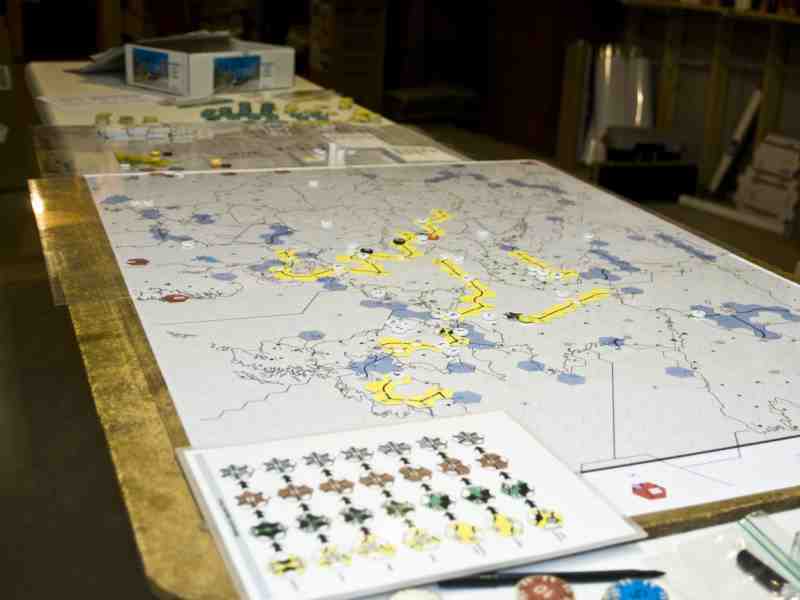 In addition, a section of the rulebook describes how to lay out the components of the game at the game's start. Players that follow these instructions will find the early rounds play faster; the layout is designed to intentionally make it easier to grab the stuff that you need when starting a Regional or Minor, or float a Regional to a Major. This has been a long journey. 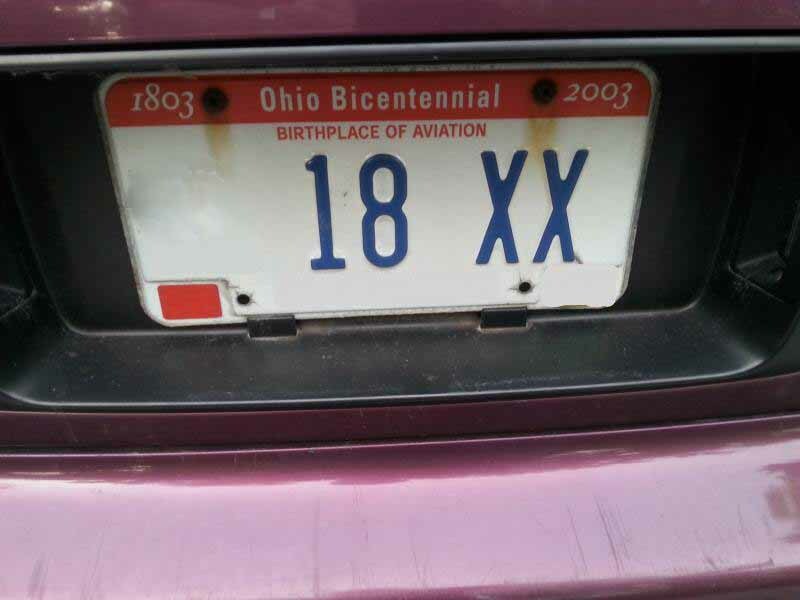 I'm sure you noticed already that this week's picture is the license plate for my car (yes, folks, I really am that nuts about 18XX games!). 18OE is finally ready to go live on Kickstarter - I'll 'push the button' on Monday morning, June 17th, after returning from Origins Game Fair. I can't express the excitement I have to be bringing this game to the masses, after almost three years of development. 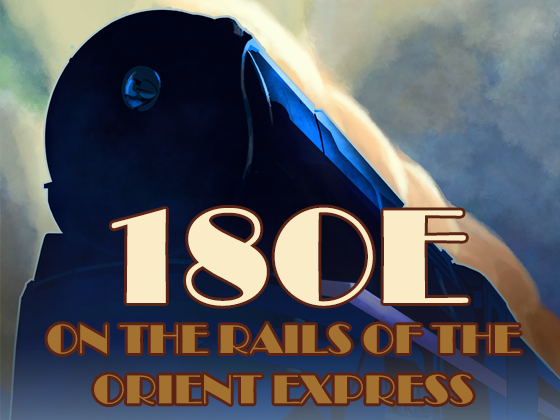 Come join Ed and I On the Rails of the Orient Express, and let's show the gaming hobby we can get this beast to print! This was the last in the series of blog posts leading up to Kickstarter. I'll add the Kickstarter link here after the project goes live. Many thanks to everyone for your interest and feedback - keep it coming on BoardGameGeek (more artwork will be posted as it is completed)! Mark Frazier, President - Designs In Creative Entertainment, LLC. By Mark Frazier on May 31, 2013. Developing a game isn't just about coming up with a cool concept, making a prototype, and torturing your buddies with your half-baked ideas on Saturday nights. As the game's flow and mechanics mature, a good developer keeps a keen eye out for how well the game's components ease the playing experience. Sometimes, what appears to be a lousy idea turns out to merely be poorly communicated through the game's components. As discussed last week, the mail contract concept turned into a real mess on the board - the contract cards cluttered the charters, and the markers cluttered the board - making the cities they were located in difficult to see. The solution, as it turned out, was not only to redesign the concept, but also to use tile-shaped components that were picked up as the cities were connected. There's always room for improvement, and contantly revisiting how the information is arranged on the components is well worth the effort. 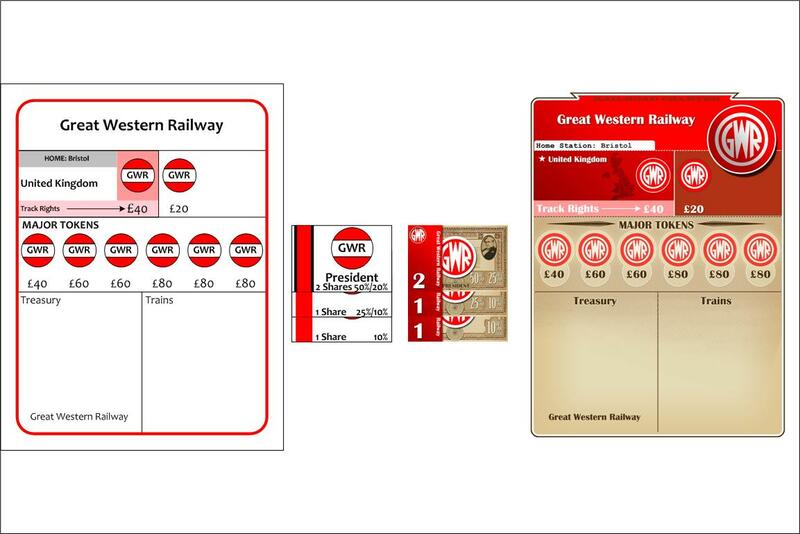 Another example of this, as shown in this week's blog picture above, is the train cards. Veteran 18XX players might have an odd reaction to this, as I'm sure you noticed that the train cards are meant to be displayed vertically, rather than horizontally. While this is a departure from most 18XX games, with the limited space available on the charters, it works much better - fanning the train cards vertically allows the cards to flow with the vertical orientation of the trains section, even if they stretch off the bottom edge of the charter. On the topic of tokens, 18OE will come with two different sizes of these for all Railroads. 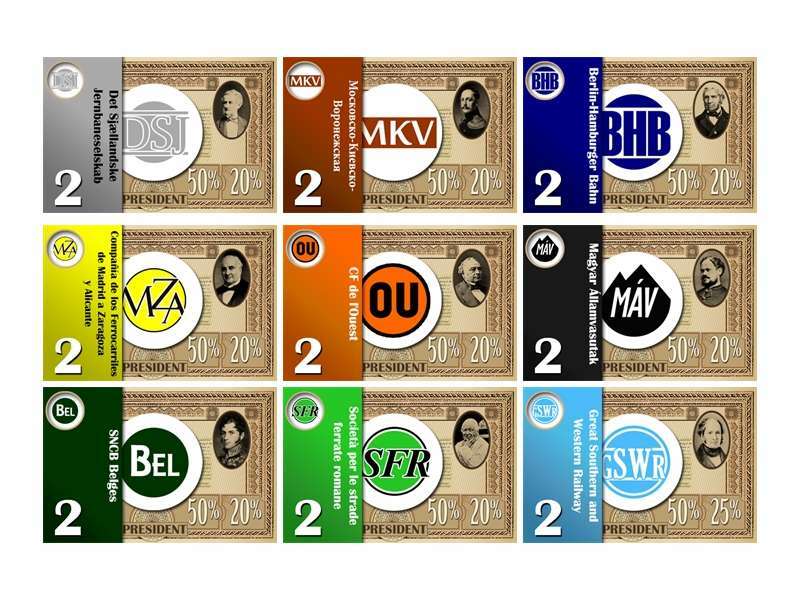 Each Railroad will have 8 small tokens, and 2 large tokens. The large tokens are designed to be used on the stock market and par chart, while the small ones are used on the board to build stations. 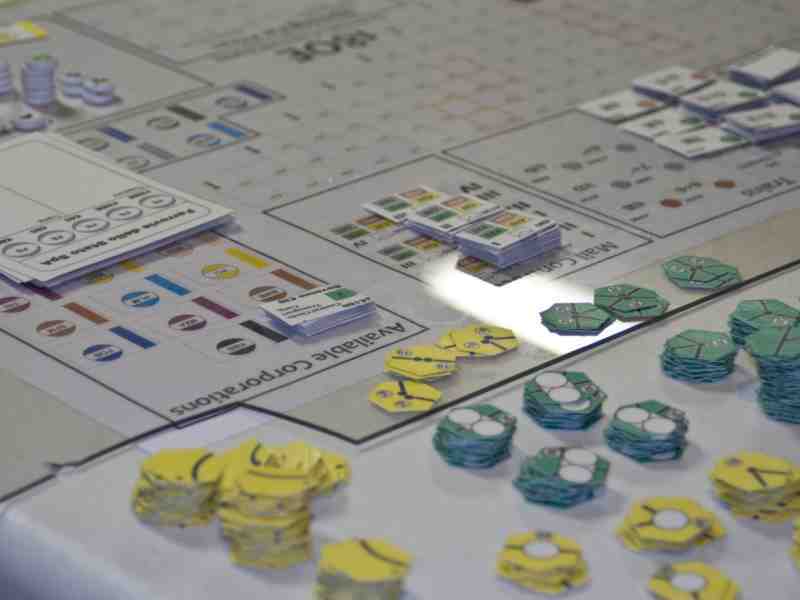 While it would have been easier to provide all tokens of the same size, it was much harder to see the small tokens on the stock market (not to mention they didn't stack easily), and the large tokens didn't fit well on the track tiles on the board. The markers are the same way - those that are used on the board are small, and those that are used on charters are large. Easier to see, easier to play with. Finally, once you've determined what works and what doesn't, you can focus on making it aesthetically appealing. Gary Simpson's efforts have been extraordinary on this front - 18OE is not only a useable game, but looks great too! The bottom line is, a good user interface is a critical element to the development process. Check back next week, where we'll talk about making a "monster" game accessible to new players! By Mark Frazier on May 24, 2013. Hobby boardgamers are a diverse group of people. Some play for the social element; some for the strategic challenge; some for their love of history and theme. Each of these desires brings with it a set of expectations for the games that will appeal to them. The social element merited a topic of its own, as covered previously. It is the give-and-take between historical accuracy and the playability of board games that is the heart of this discussion. It's fair to say that the smaller and shorter a game is, the more abstract the game's mechanics must become as a consequence. For these games, it's much easier to suspend disbelief while playing, as players' expectations tend to lean more towards strategic or social value than realism. The larger and longer a game is, however, the more important historical accuracy can become in players' minds. As one of the greatest challenges of designing a large game, achieving realism can quickly become a difficult problem. There are always tradeoffs to be made, and those tradeoffs can risk alienating players whose primary desire is to simulate history. It is only when those tradeoffs provide enough replayability that they merit the change. With 18C2C, the biggest challenge was dealing with the initial concentration of railroads in the eastern U.S., followed by their rapid spread across the Mississippi and out west. Attempts to constrain the available railroads at the beginning of the game to those east of the Mississippi created playability problems that ultimately became intractable. Railroad congestion was severe, and players were constantly tripping over each other while buiding track. What was worse, was the Great Plains and western regions were simply not developing enough before the end of the game. Eventually, the decision was reached to simply allow railroads to be opened anywhere at the beginning of the game. Even though that's clearly ahistorical, it played very well - a clear case of playability trumping realism. In 18OE, the problem was even more pronounced. Different countries began railway construction programs at different times, sometimes varying widely in the amount of development that occurred during the 19th century. 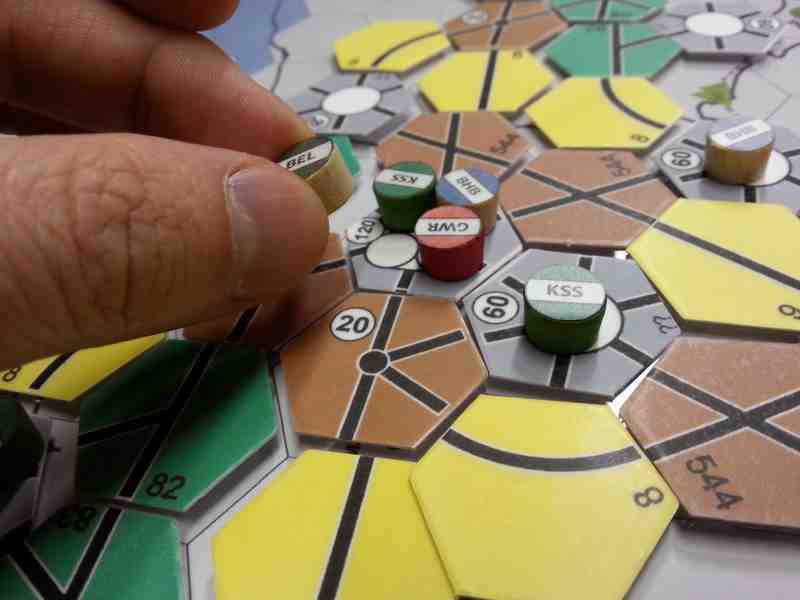 From our experience with 18C2C, we realized that staggering the opening of Railroads severely reduced the replayability of the game, and decided upon a different mechanic to simulate the restrictive nature of national boundaries - Track Rights. We began the playtesting process with the Track Rights mechanic, requiring Railroads to purchase a Track Rights card for every zone that the Railroad wished to build or run trains in. Many Track Rights zones were some combination of countries, as some (such as Belgium, Holland, Norway, Sweden, and Denmark) were simply too small on our map scale to justify being separate. Even so, the Track Rights mechanic quickly bogged down, creating massive confusion and too many "fiddly bits" to keep track of. We needed another solution that made the game playable. This is where the Regional to Major mechanic came to the forefront of development - a Regional can only build track and lay tokens within its own national boundaries, but once it grows into a Major, it may construct track and lay tokens anywhere. Simpler? Yes. Ahistorical? Absolutely. But was it playable? You bet. We were able to blend a much more abstract, but elegant form of constraint into the system that created a strategic challenge to the player: stay as a Regional, and you collect a much larger percentage of your dividends. Grow into a Major, and you lose the contraints of your Track Rights zone, but lose a significant percentage of your ownership. And the best part was, there was still a national flavor to the game even with the scaled-down Track Rights mechanic. Attempting to simulate the shifting national boundaries of Europe on 18OE's timescale was also quickly scrapped. We settled on the boundaries from 1882, which was the first year that the Orient Express operated. Simulating the effects of two world wars was also a very short lived idea, for the same reasons that 18C2C does not simulate the effects of the American Civil War. Our philosophy is that when realism and playability are not meshing, to err on the side of playability. After all, if the game doesn't provide an enjoyable experience for the player, it's highly unlikely to hit the table again. Regardless, the portrayal of history can be dealt with in a myriad of ways, not all of which have to be built into the mechanics - sometimes, you can provide a sense of history by using the components. Notice the presidential certificates in this week's blog picture; each one contains a portrait of a person that was very influential in the development of that Railroad. A nice historical background section, which will identify each portrait and explain their relationship the Railroad, will be included in the Playbook for flavor. Hats off to Gary Simpson, folks, for an unbelievably fantastic job on the artwork! Check back next week, where we'll discuss the challenges of game interface design! By Mark Frazier on May 17, 2013. My real-life job is as a Software Engineer. I say this, because I have spent the better part of twenty years focused on designing human-machine interfaces. Much of what attracted me to the boardgaming hobby had the same draw for me to software engineering. For that matter, much of what is involved in the development and publishing process of a boardgame bears a striking similarity to the same type of development and deployment work I do as an engineer. That's one classic example of a mechanic that didn't work well. The rules for claiming those tokens were complex (rules issue); the tokens cluttered the board badly (components issue); and the constant revenue stream from the contracts created too much chaos with the game's flow (another rules issue). Much time and effort went into trying to rescue the mail contracts before giving up on them as a mechanic. As Antoine de Saint-Exupery stated, "A designer knows he has achieved perfection not when there is nothing left to add, but when there is nothing left to take away.". One repetition after another, game mechanics and components were either repurposed, replaced, or removed altogether. When issues arose, it was important to also remember that problems can frequently be solved in more than one way - and understanding the impact on other game mechanics is crucial to fixing a problem in the most elegant fashion. Too many Railroads? Get rid of some of them. Still too many? Hmm, those Nationals might not have to be separately run Railroads, perhaps we can abstract them into the game by having Majors convert to form them? Ah! Now, THAT worked beautifully! The final stages of design and development involve as many repetitions as you can get, increasing the feedback loop, and closing loopholes. I ran a large online playtest group in 2011, where over 30 players formed seven games and used a Cyberboard prototype to play. It is to this group that I owe a huge debt of gratitude; they provided invaluable feedback that allowed me to make the final changes to the game to make it playable in one day. And, interestingly enough, once everything ELSE was working really well, we noticed some players complaining about the rather monotonous route building in the game. With three types of cities - cities, Grand Cities and Metropolises in increasing order of endgame value - we started to see a sameness from one game to the next, as players focused solely on the Grand Cities and Metropolises for routes. In a stroke of brilliance, Ed was able to reintroduce his mail contracts in a much streamlined form, and create a rich trackbuilding environment that changes every time you play. The ultimate solution? Patronage Tiles (see the picture below), which don't provide a constant revenue stream but give you a one-time bonus when you build to their city, and the reduction of the number of token positions to provide enough constraint to force players into building multiple, different routes across the board. As much of an interface engineer as I am, I'm certainly no artist - and I must say, Gary Simpson does some incredible work, breathing some real life into this game. Check back next week when I'll talk about realism vs. playability, and how it affects 18OE! To War(game) or not to War(game)? By Mark Frazier on May 12, 2013. I "grew up" on 18XX games playing the classic Avalon Hill's 1830. The regular group that taught me how to play was full of talented players. 1830 can be a brutal game; it's quite easy to get cut off from a good run by hostile tile and token placements. New York is the highest valued stop at each stage of the game, and as such can be highly contested by nearby railroads. 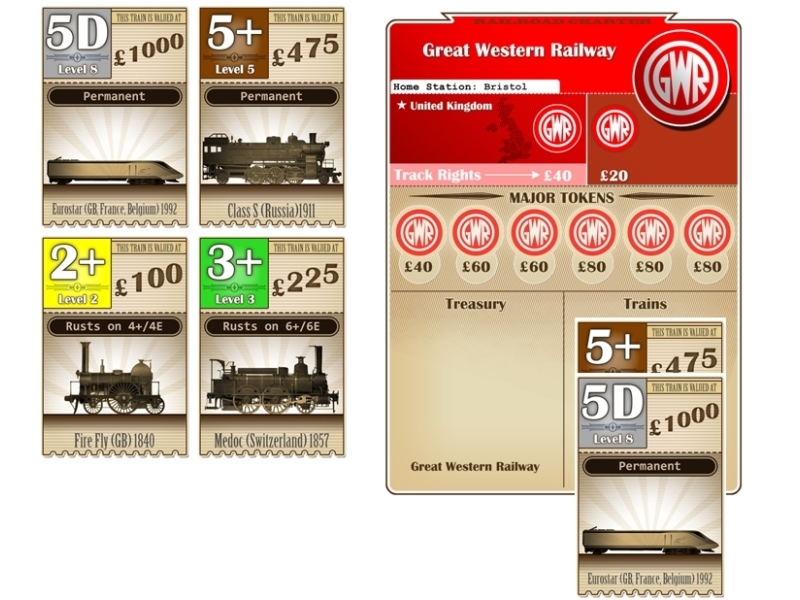 In a game where money is king such as 18XX, it can serve a player well to make use of all means available to increase the value of their own stock holdings, while simutaneously reducing that of their opponents. The group that I played 1830 with was like a pack of vicious wolves - any opportunity that served to help their own position was exploited, and many times, that also involved hurting another player's position. Of course, there's the metagaming aspect of all this - the diplomatic aspects of most board games has been hotly debated everywhere you can find a forum on the topic, with as many different viewpoints as there are people with a voice. Some people prefer a distinctly peaceful style of play, while others are distinctly and unapologetically aggressive. It really comes down to a matter of personal taste, and of finding the right group to play with. I learned, while playing with the 1830 group, how to play both aggressively and defensively. I've always considered myself a more skilled route builder than stock manipulator, as evidenced by 18C2C's design. Because of this, I spent many an 1830 game banging my head against the wall trying to build a huge endgame diesel run, only to have it chopped to bits by well-placed track and tokens from my opponents. My mantra became "It's not over until Frazier pops the Diesel! ", and I lost count of the number of times that I came in second place - my consolation prize being "if it had gone one more set of operating rounds, I would have won!". Playing with this group helped me to hone my 18XX skills, and I relished the challenge. 18C2C's original game design was borne out of my preferred play style, but due to the lack of exposure to outside play groups, many aspects of game flow were based upon the assumption that all 18XX players were much like my original play group. When I began running the game at conventions, game clubs, and online, I was quite taken aback by some players' reactions to stock sales (even if for profit; having purchased them at par and selling above par) and aggressive token placement - in fact, most of the groups I've played with since are much more cooperative than aggressive. This was a valuable lesson to learn as a designer; one that I took into account in the design of 18C2C's "D" Variant, and one which I took to heart in the development of 18OE. The "D" Variant forces players to drop tokens in order to effectively run their "D" trains, bringing the design in-line with my original intent. Players now have the option to play a more potentially cooperative game by using the standard rules, or playing a more aggressive game, by using the "D" variant rules. The stock market mechanics in 18C2C allow the player to defend themselves by buying up all of their own stock. In 18OE, I also intentionally left this choice to the players. There's plenty of opportunity for shenanigans, and token positions in key cities are coveted by all close by (and not so close by!) railroads. During development, I wrestled with the problem of the proximity of many railroads to one another. Many times, a railroad could get completely cut off from a run by a near by railroad that operated first, placing hostile track that prevented any chance at all for the poor sap running next to get connected. This was solved by the Right-Of-Way rules, a mechanism whereby a railroad may connect into an existing route on its first turn of operation. On one hand, the highly skilled 18XX player could argue that the affected player should have seen this coming, and not floated a vulnerable railroad in that location in the first place. 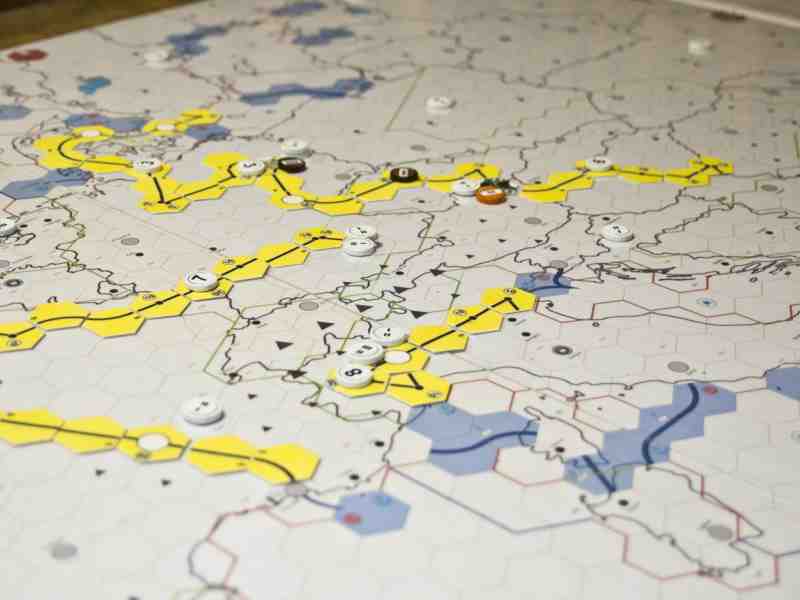 On the other, leaving the issue alone would have left a bad taste in the mouth of players that do not like aggressive action, as well as players new to the 18XX system. Right-Of-Way is a part of the ruleset for precisely this reason, and an optional rule was included in the Playbook to allow players to play without these constraints. The Right-Of-Way rule is the standard, but if aggressive play is fun for you (and your group! ), then the choice is yours! Ultimately, choice is good, because no particular play style is better than any other - the ability to play in a way that's fun for you increases the play value of any game. So, choose your opponents (and rules) wisely, and most importantly, have fun! By the way, if you haven't seen it already, I've released the rulebook on Boardgamegeek. The images in the rulebook will still need to be updated as the artwork is completed, but what you're reading here is the game's rules as they'll be in print. Check back next week, where I'll talk about the process of iterative design - what once was, and what is now in 18OE! By Mark Frazier on May 2, 2013. I started out making 18C2C kits with a very primitive process. Most of the components were printed on cardstock, spray-adhesived to a second sheet of cardstock for thickness, and coated with contact paper. No cutting was done on these early sets; the customer was in for a massive 30 hours of scissors work (my fingers hurt just thinking about it!) when they received their copy. The map was printed on letter paper, and the tokens were simple 1/2" wood plugs, spray painted in batches of 18 different colors. Even the stickers had to be cut out - ugh! As time went on, and orders began to stream in, I refined my process and components. John Tamplin of Deep Thought Games was kind enough to share with me his techniques, and I soon invested in an Ellison Die Cutting machine and a BigMouth laminator. This allowed me to produce much higher quality certificates, charters, and tiles, and sped the manufacturing process up considerably. While I had tackled most of the nagging issues regarding the kits, I knew I had to do something about the map. A large-format printer and a large-format laminating machine were next up for capital investment. This was well worth the money, as I was finally able to produce the map in two huge sheets measuring 24" x 66". Once laminated and trimmed, these fit snugly into a mailing tube for transport. I took a haitus from making 18C2C for a few years, from 2008 to 2010. When I finally came back up for air, and decided to begin taking orders again, a strange and wonderful thing had happened: the internet had exploded into ubiquitous use, and BoardGameGeek now had a web page dedicated to my game! Much to my surprise, I was deluged in orders for a much improved quality kit. As I cranked out one order after another, Ed and I began work in earnest on 18OE. I had originally planned to make these by hand, but realized that the customer base had grown to the point that I'd never be able to keep up with the backlog. The final piece of the puzzle slid into place when I read a news article about Kickstarter and the new crowdfunding craze. Now, Kickstarter has its drawbacks, for sure. Doing research on what works (and especially what doesn't) is paramount to a successful campaign. After studying successful game projects and reading Kickstarter's FAQ, I decided that this was my best chance to turn 18OE into a commercial-grade print run. The beauty of Kickstarter is that it gives small-timers like me the chance to do something big, by providing services that would cost a prohibitive amount of money to implement on my own. And so, here we are: five weeks from launch. I've been in contact with multiple manufacturers, suppliers, and other industry contacts to whom I owe a huge debt of gratitude to for their generous advice. I've rewritten this entire website from scratch, and run countless playtests online, as well as at multiple game conventions. And I'm not done yet; there's still a ton of work to do before June 10th. Check back next week, where I'll talk about gaming styles and choices! By Mark Frazier on April 26, 2013. 18C2C, my first monster 18XX game, was first published in 2003. I stood outside the garage at my condo apartment, spraying 3M adhesive on one sheet of cardstock, sticking it to another, and manually cutting out sheets of contact paper to coat the printed side. Everything about one of these first kits was done manually; even the map was printed out on 30 pages of letter-sized printer paper - the customer had to mount these to a board to put the map together! That was ten years ago. My wife, Susan, even bet me that I'd never sell more than ten copies of the game. After I went "live" with my project, and immediately received 30 orders, I was rewarded with a nice dinner out by a VERY surprised Mrs. Frazier :) Since then, I've watched in amazement as the internet community of 18XX players grew, and orders for my game continue to mount. My dear friend, Ed Sindelar, had been knocking around an idea for a new monster 18XX game for many years. 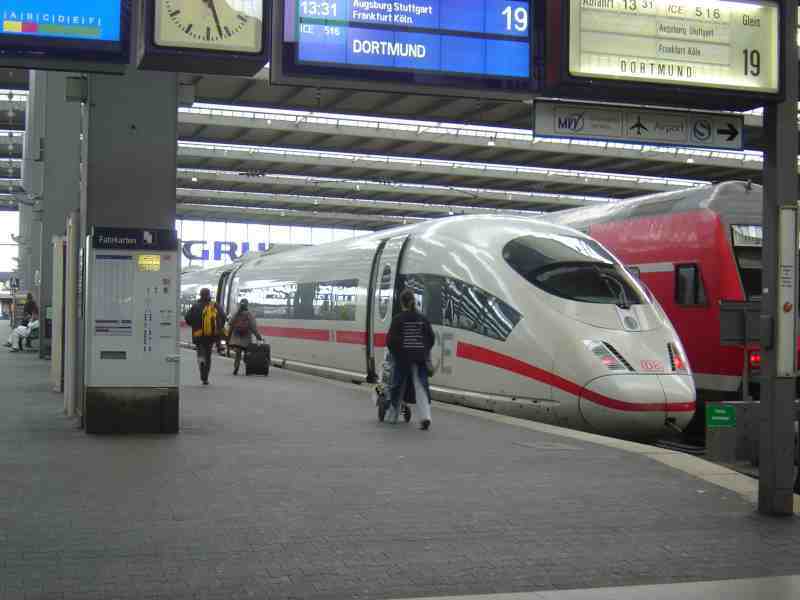 He had taken a trip overseas, and rode the trains throughout Europe. This served as the inspiration for what would eventually become 18OE: On the Rails of the Orient Express. About two and a half years ago, we finally decided to take the plunge and start into the development process. The developer role was new to me, managing a designer - rather than using a design of my own. I can't count my blessings for having Ed to work with - his easy personality, boundless patience, and ideas for innovative game mechanics renewed my passion for 18XX! Developing and publishing a game is as much about hard work as it is about fun. 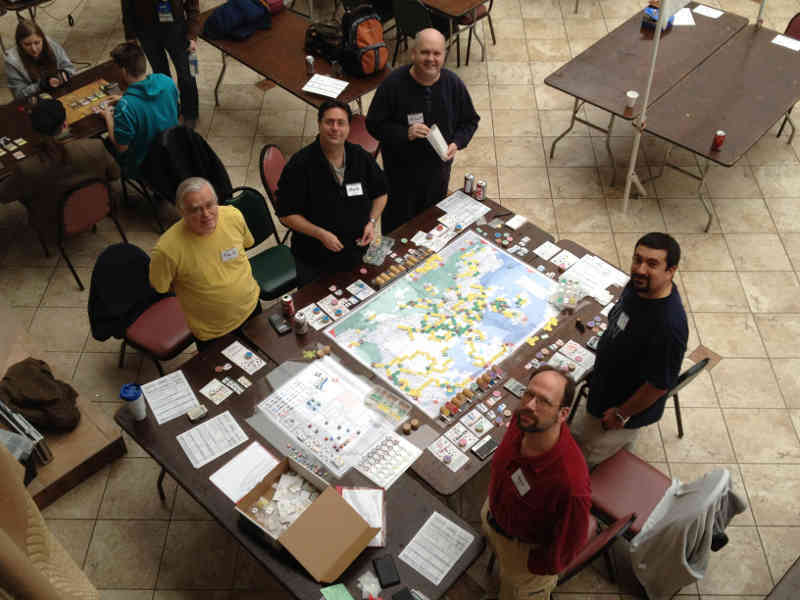 Travel to conventions (thanks, JC and crew, for a truly fine reception at Kublacon 2011! ), trips to CABS in Columbus for playtesting, and the seemingly never-ending iterative process of note-taking, rulebook editing and component updates. The end result, we hope you'll see, is a truly rich experience of railroad building in Europe - as well as a game that challenges you. The boardgaming hobby has seen a renaissance over the last several years. I have always had a passion for hobby gaming, starting when I was thirteen years old. This project is more than just a dream - it's also a huge thank you to everyone who has supported and encouraged me through the publishing of 18C2C, and the lengthy and thorough development process of this game. Let's show the hobby game industry we can get a monster 18XX game to print! This is the beginning of a weekly blog, where I will outline the trials and tribulations of my journey towards Kickstarter.